A special court in Hyderabad trying the multi-crore accounting fraud in erstwhile Satyam Computer Services Limited (SCSL) on Monday said it will pronounce its judgement in the CBI-probed case on April 9. Citing voluminous documents in the case, Special Judge BVLN Chakravarthi said, "On April 9, the judgement will be pronounced. I am making it very clear." "It is mandate of the Supreme Court that judgement has to be pronounced. If any obstruction is caused it is contempt of (apex) court...it is your (accused) duty to bring your advocates. Court will go ahead with its proceedings," he said. The judge's observation came as defence counsels were not present in the court ostensibly because of the ongoing agitation of Telangana advocates, who have been boycotting courts demanding separate high court for the new state. "April nine will be the final date for the verdict. No question of further adjournments. Court will not wait," the judge said. During the last hearing on December 23, 2014, the court had said it would pronounce the verdict today. On the possible reason for pushing further the judgment date again, CBI counsel K Surender cited the voluminous documents of the case as well as the time needed for "typing the judgement." Touted as the country's biggest accounting fraud, the scam had come to light on January 7, 2009, after the erstwhile firm's founder and then Chairman B Ramalinga Raju allegedly confessed to manipulating his company's account books and inflating profits over many years to the tune of crores of rupees. All the 10 accused in the case, who are out on bail, were present in the court today. Around 3,000 documents were marked and 226 witnesses examined during the trial that began nearly six years back. 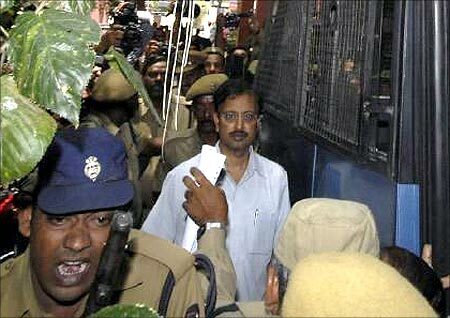 Besides Ramalinga Raju, the other accused in the case are: his brother and Satyam's former Managing Director B Rama Raju, former Chief Financial Officer Vadlamani Srinivas, former PwC auditors Subramani Gopalakrishnan and T Srinivas, Raju's another brother B Suryanarayana Raju, former employees G Ramakrishna, D Venkatpathi Raju and Ch Srisailam and Satyam's former internal chief auditor V S Prabhakar Gupta. During the trial, the CBI alleged that the scam caused a loss of Rs 14,000 crore (Rs 140 billion) to shareholders of Satyam, while the defence countered the charges saying the accused were not responsible for the fraud and all the documents filed by the central agency relating to the case were fabricated and not according to law. On December eight last year, Ramalinga Raju, Rama Raju, Vadlamani Srinivas and former director Ram Mynampati were sentenced to six months' jail term and fined by the Special Court for Economic Offences in connection with complaints filed by Serious Fraud Investigation Office (SFIO) for violation of various provisions of the Companies Act.